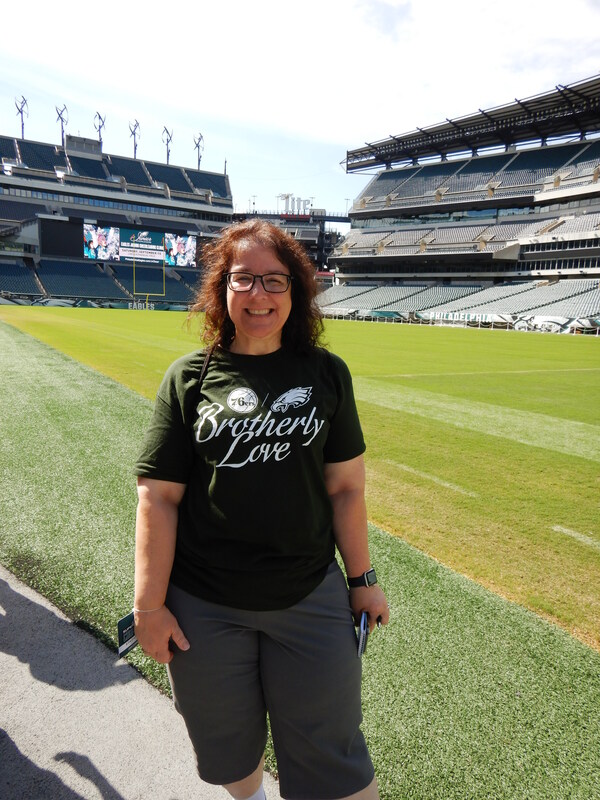 On Saturday, September 15, I had the amazing opportunity to journey with a group from Penn State Brandywine and Amy Mawby, Director of Public Programs at Tyler Arboretum, to Lincoln Financial Field. 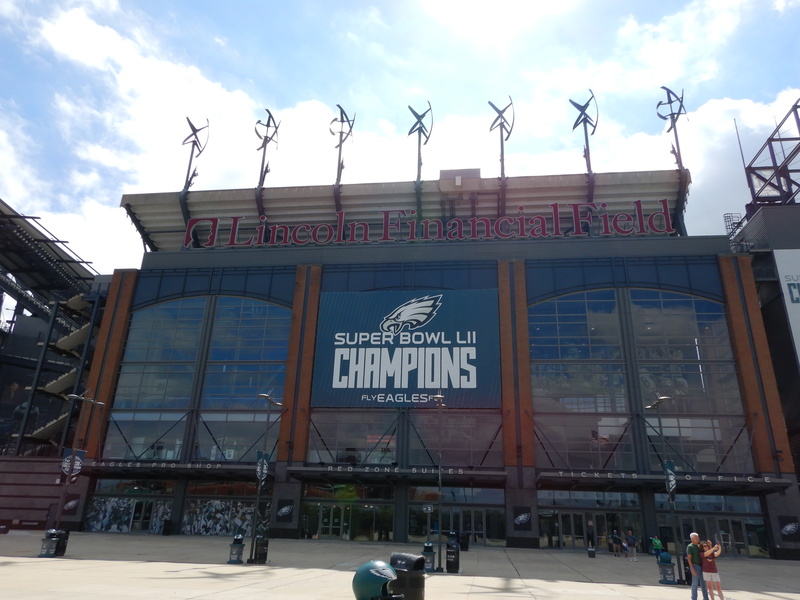 For those in southeast Pennsylvania, I certainly don’t need to mention that this is the home of the Super Bowl champion Philadelphia Eagles! 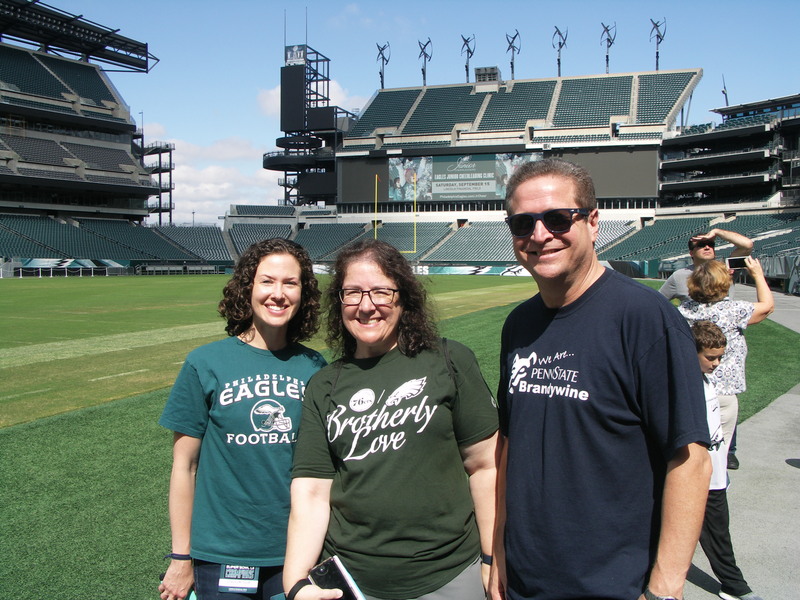 This stadium is known as one of the most “green” stadiums in the NFL, and as co-chair of the Sustainovation Team on campus, I booked a private tour for the campus to learn more. We had a great tour guide that was a wealth of knowledge about the sustainable practices in place, from the original construction to what happens on game day. We started by learning about the power to the stadium. 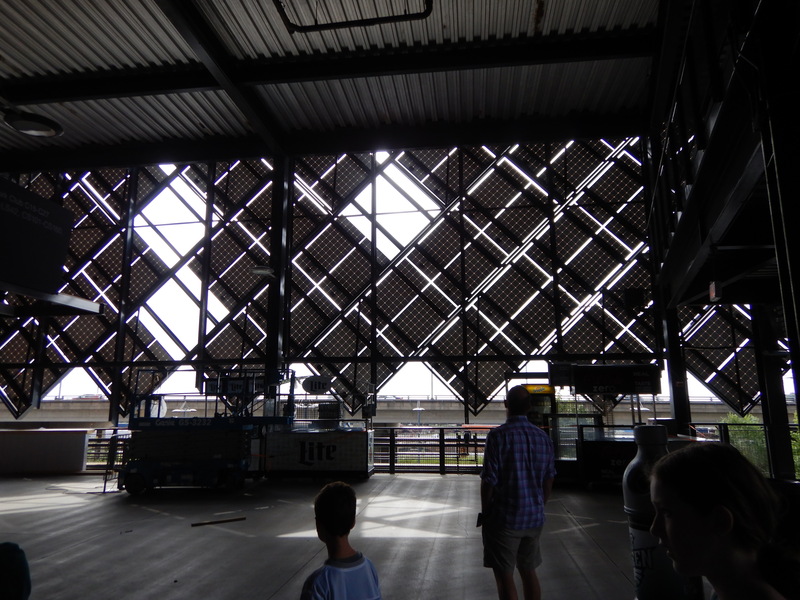 There are many visible solar panels outside, along the side of the stadium which are easily visible from I-95. But most solar panels are not seen by the public, as they provide the shade for parking areas. 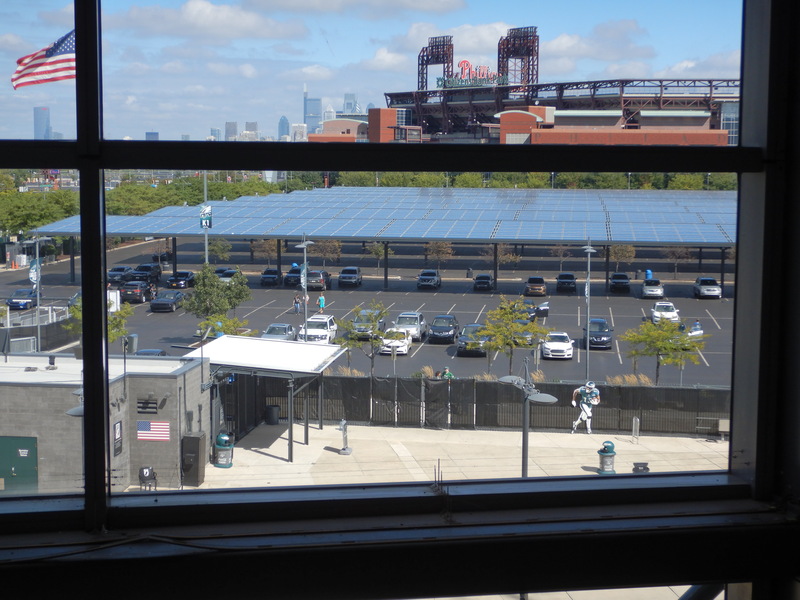 The solar panels were designed by NRG Energy (yes, the same NRG that the Broad Street Station is named after) and provide 33% of the energy to the stadium. There are sustainable practices in place outside the stadium, such as rain gardens along Pattison Avenue and 11th Street. 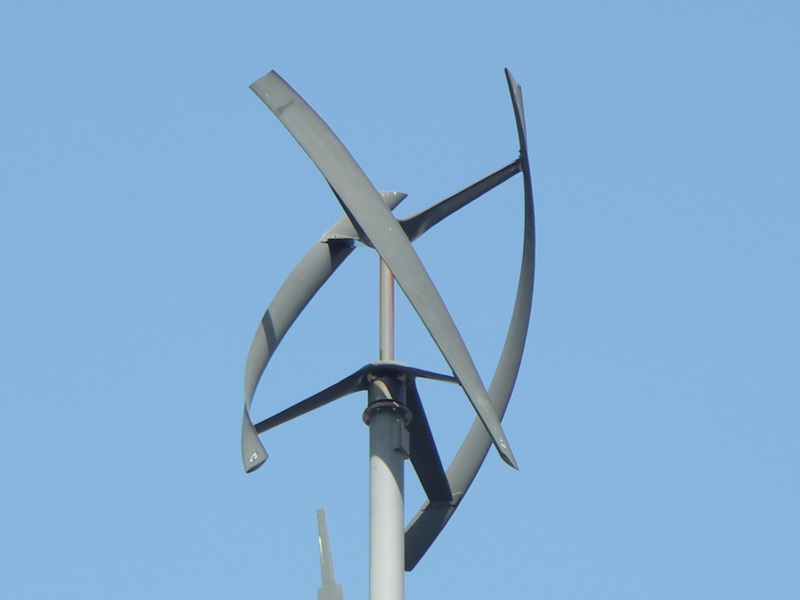 What surprised me was the information about the wind turbines that line the top of the stadium – they really don’t provide any energy! We were told that if all 14 wind turbines were rotating at a speed of 50 mph, they would only be able to power 3 hair dryers. In other words, they are a “show” of sustainability, but not part of the practices of the stadium. We were brought down to the field – a field that is mowed 5-7 times per week, with the clippings composted and the mowers powered by biodiesel fuel. There are pipes that run under the field to keep it heated on winter days, as well as sprinklers located 2-3 inches below the field surface (so the cleats don’t hit them!). The paint on the field is chalk-based. 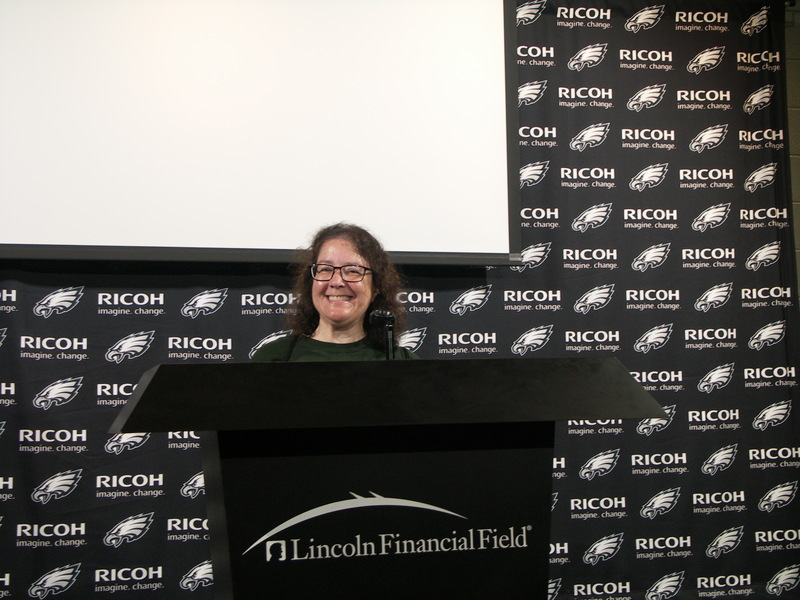 Then the next two parts of the tour didn’t have anything to do with sustainability, but were so cool to experience – going inside the Eagles team locker room, and learning what the song is that the Eagles walk out of the locker room and down to the tunnel on the field. Do you know what it is? (It’s in the poorly recorded video below, which ends right at the entrance to the tunnel on the right) All of us on campus want this as our entrance song now! And did you know that this LEED Sliver Certified building generates zero waste, that all 950 tons of waste every season is recycled, composted, etc.? 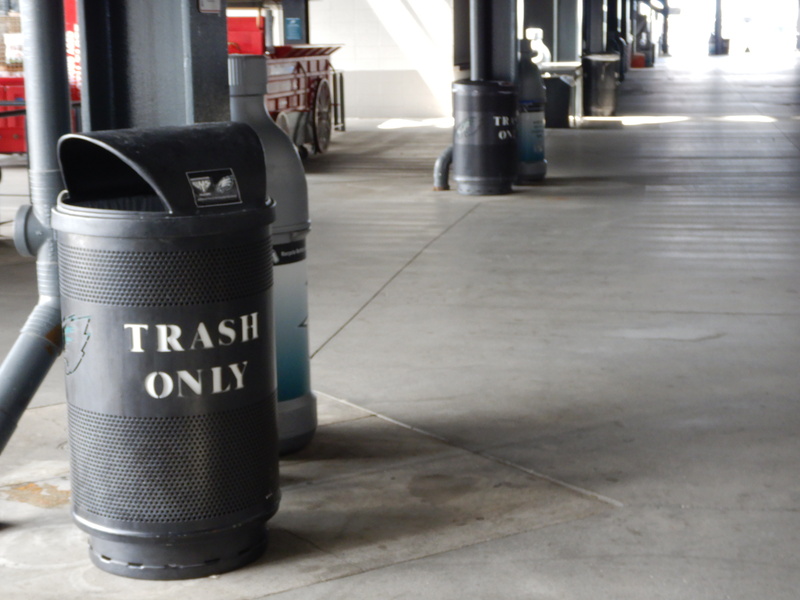 The green efforts are very clear, as you can see by the trash and recycling containers in the concourse. These bins are placed every 20 feet, as a study done by Disney showed that people are willing to carry their trash 20 feet, but not further, to throw out/recycle. 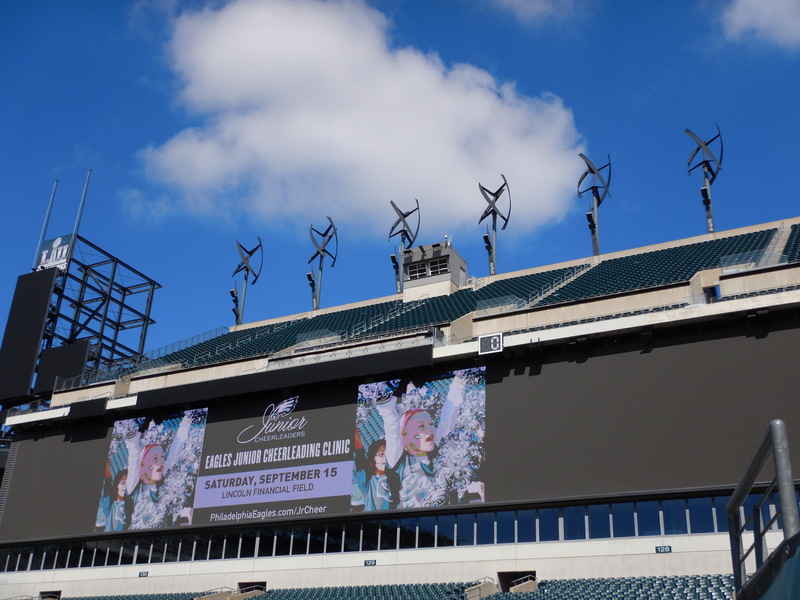 There is so much more to the sustainability story of Lincoln Financial Field, I definitely want to go on a green tour again! 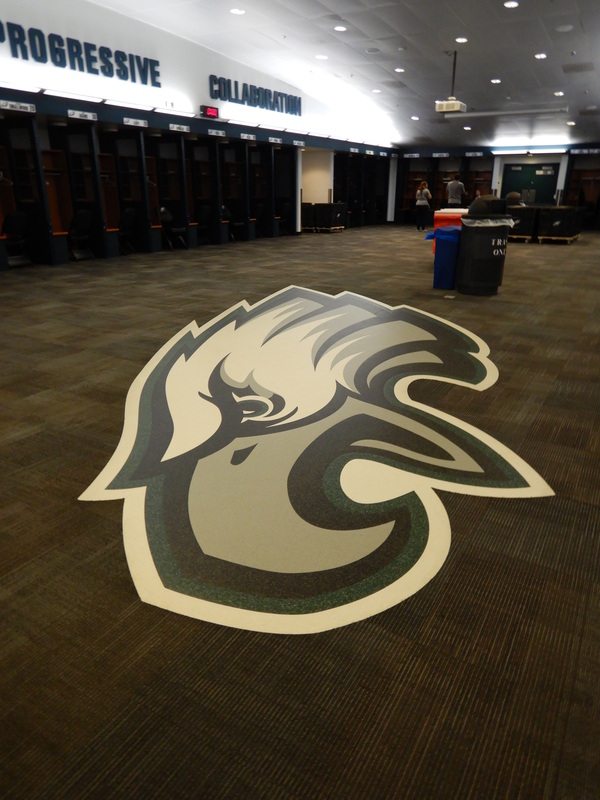 Eagles locker room! 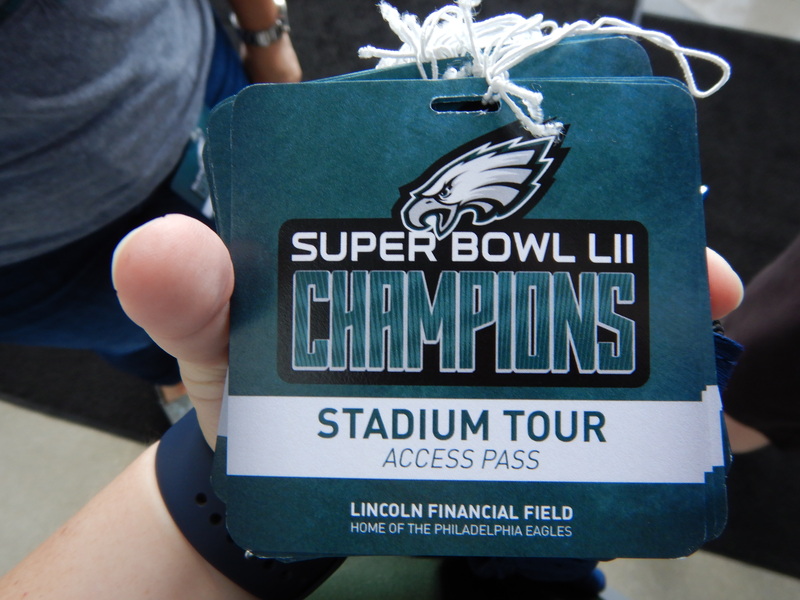 But don’t step on the Eagles logo!